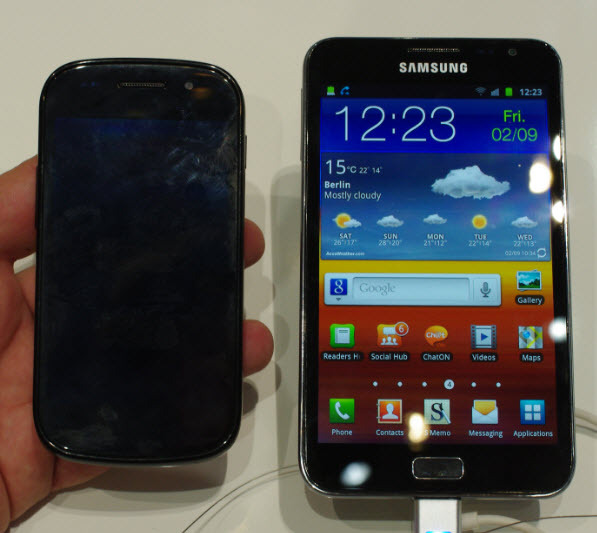 Samsung has launched another new handset, Samsung Galaxy Note. 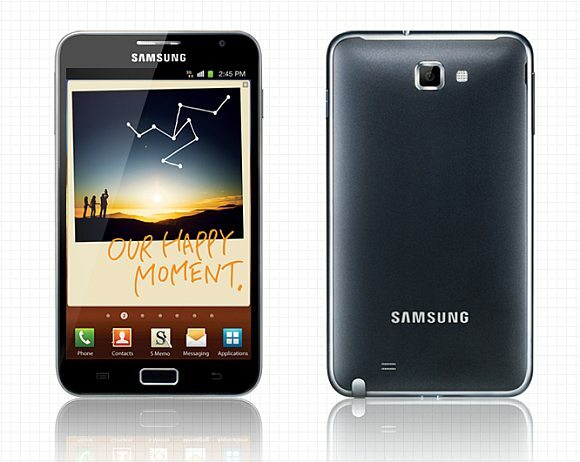 Samsung Galaxy Note comes with a gigantic 5.3 inch display and 800*1280 resolution. The 5.3 inch AMOLED display, larger than the smartphone is said to provide vivid clarity compared to the other conventional displays. It delivers the best viewing experience. A 180 degree viewing angle is offered so that the contents can be shared comfortably. Due to the larger display one can easily view web pages, powerpoint presentations, eBooks and various other applications without much scrolling and zooming. It is powered by 1.4 GHz dual core processor, running on Android 2.3 Gingerbread and is packed with 1GB RAM and TouchWiz 4.0. There is 8 megapixel camera on the rear along with LED flash and 2 megapixel camera in the front of the handset. The camera includes action shot, panorama shot, smile shot and share shot. It weighs 178 grams and is just 9.65m thick. Other features include WIFI direct support, Bluetooth 3.0, 802.11 b/g/n, microSD card slot, HSPA+, GPS with A GPS, 3.5 mm jack, 2500mAh battery and sensors like accelerometer and proximity. The battery can deliver talk time of up to 13 hours in 2G and up to 4.6 hours in 3G and whereas standby time of up to 570 hours in 2G and up to 390 hours in 3G. There is an enabled S Planner that integrates schedule and to-do list. Samsung Galaxy Note also features a multimedia application called S Memo that can record the content created by the user. Also, handwritten notes and drawings, typed text, voice recordings, pictures can be captured with an application called memo and used for editing or can be shared. It boasts of a S Pen capacitive stylus technology and combined with full touch screen. The pressure sensitive stylus will let the users take down notes easily. It is good for artwork and sketching accurately. There is a Free Capture Mode for allowing the user to capture the area of screen with S Pen. Samsung Galaxy Note will also get into partnership with Juniper Networks. Junos Pulse SSL VPN by Juniper will be providing secure remote access and meet the authorization requirements. 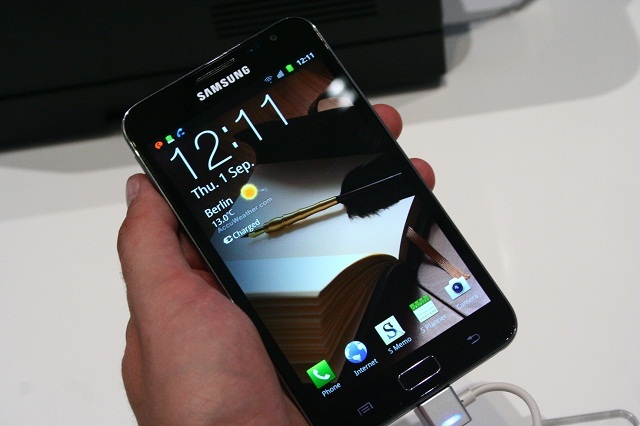 Samsung Galaxy Note will hit the shelves in the market in UK Q1 of 2012 and it will be launched in US later. It can be pre-ordered via online portal Clove for the UK enthusiasts. It is expected to be priced around 700 euros and around $1000 in US. why it has andriod 2.3 ? why not it is upgraded?